There's been some yarnbombing going on in my area lately - or the 'Phantom Knitter', as the press have dubbed her/him. Knitting cozies for lamp posts and trees is great, but you know what I think is even better? Yes, you can knit your own little home for succulents or other plants, then hang them up somewhere that could use a little bit of greenery. 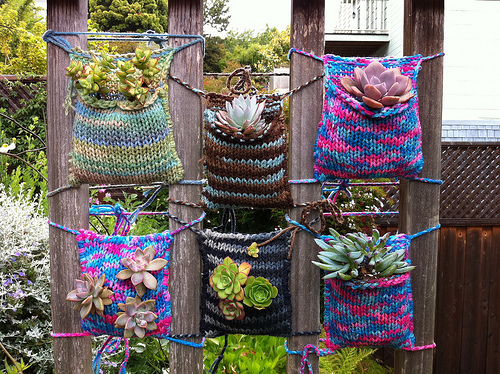 Click on over to the links above for a pattern and instructions for the pockets, or try plant pillows where the plants are literally growing out of the knitting. I think those would make great gifts. This, combined with some moss graffiti, would make an awesome living art project.